Bassiri adds some style to your casual fashion clothing wardrobe. It won't be hard when you choose Bassiri brand shirts. Bassiri makes a collection of very nice looking short sleeve casual fashion shirts in button down styles with all sorts of fashion prints on them. 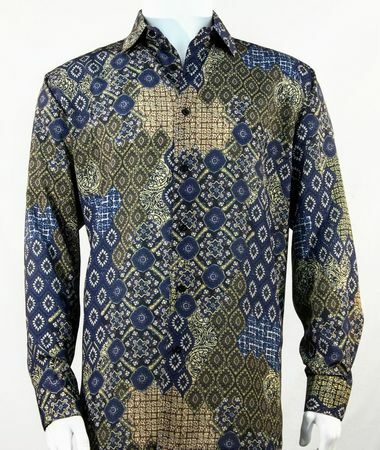 This long sleeve blue and bronze pattern shirt features an eye catching print that just wants to be worn to a party. Made of fine texture microfiber.